If you met Scott Berns, you’d immediately think “this is a great guy.” Although he runs marketing operations for the 3rd largest telecommunications company in America, he’s a humble, down-to-earth person that’s both a fantastic leader and constant student of learning. Scott has been leading the marketing operations team at CenturyLink for the past seven years, running it as a profit center. During that time, he’s grown the team from a handful of people to around 70 now under his leadership. What you’ll learn from Scott is how well he knows the marketing operations game and he’s happy to share his insights and lessons with you. Scott has led his team to winning the Marketo Transformation Revvie Award and has been finalists for Marketing Team of the Year. His marketing operations manager, Kate (Cindric) Federhar, who has also been on DemandGen Radio, was a finalist this past year for Marketer of the Year. 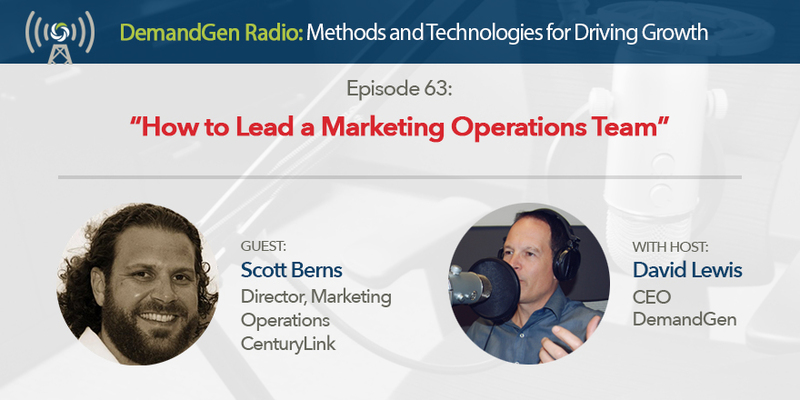 These guys (and gals) are winners, so if you want to know what a top marketing operations leader does and how he does it, this episode is for you.